I have never set foot on Kokol Hill for half a century until I got involved in paragliding activities. Since, childhood I could see Kokol Hill very clearly, but never thought of going up here. Kokol Hill is actually part of the Crocker Range, the mountainous backbone of Borneo. It stretches all the way to Kalimantan, Indonesia. The most iconic scenery is the Saint Joseph Church, towering over the central highland of Kokol Hill. Overlooking the City of Jesselton (Kota Kinabalu), the view is so majestic and inspiring. I have said this before, this place looks like Tropical Switzerland! 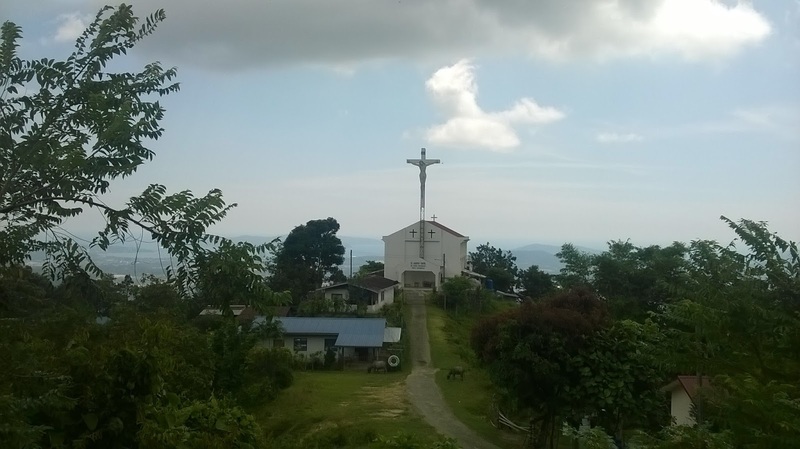 Even though Kokol Hill is close to the city, it is relatively an un-visited destination! How sad! It is only less than 45 minute drive from the city center of Kota Kinabalu, the roads are very good and there is a lot of interesting places to visit around this hill. The highest point of Kokol Hill is the Paragliding Take Off Base which is about 800 meters high (2800 feet above sea level). Not only you can see the whole view of Jesselton and its surrounding islands and sea, but also Mount Kinabalu on the other side. Kokol Hill is also home to the secondary dipterocarp (tropical rainforest) growing together with fruit and rubber trees planted by the local people. On several occasions, I heard deer barking and through my gliding experience, seeing eagles building their nests in the forest canopies. From above, I could also see so many varieties of wild flowers which make Kokol Hill such a wonderful place to go. BUT ALL THESE IS NOT GOING TO LAST LONG! Ignorant local landowners, developers and land speculators are going to destroy these beautiful hills. The natives who owned most of the lands are damaging the environment by their practice of the traditional shifting cultivation, BUT worst still greedy developers and speculators are buying over from these people. AND these buyers come with one thing in mind, to open up the land for rubber or oil palm plantations or simply just to clear the jungle! To them, clearing the vegetation means higher value for their property! And any new plantations will destroy the natural bio-diversity of this area. Kokol Hill, with its remaining flora and fauna can offer more benefits to the local people if it remain intact compared to their clearing just to give way for other development. Something must be done to save this hill, otherwise it is condemned to destruction.